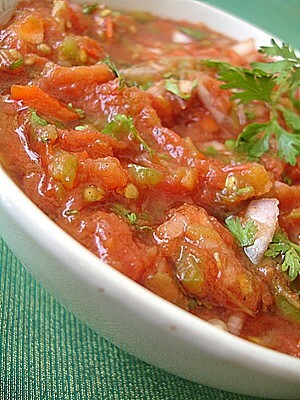 Tomato Salsa recipe by swtmanoo at DesiRecipes.com. Coat tomatoes, capsicum, green chillis and garlic with olive oil such that they are oiled all over. Arrange in a greased shallow baking tray and keep and broil 10-12 minutes. Remove and cool. Discard the skin of garlic , the tomato cores and skin. Combine the garlic , tomatoes, capsicum and green chillis in a bowl and using a hand blender, puree roughly. Alternately, run in a mixer grinder for a few seconds. Be careful not to make a smooth paste of it. It should be chunky and coarse. Add chopped onions, salt , pepper, sugar and fresh parsley to the coarse paste and your salsa is ready. you can store salsa in the refrigerater for a few days and in that case don�t add the onions. add onions only at the time of serving.